Where is the Wanaka Trail Ride? Coming from Wanaka there will be a sign from the Red Bridge, and then at the SH8a (Luggate-Tarras Rd.) turn off onto Jolly Rd. From there it’s approximately 2.5km to the base paddock turn off. There will also be a sign from SH8 (Tarras-Cromwell Rd.) onto Jolly Rd. From there it’s approximately 4.2km to the base paddock turn off. What time do the trails open / close? What time will rider registration/sign in start? 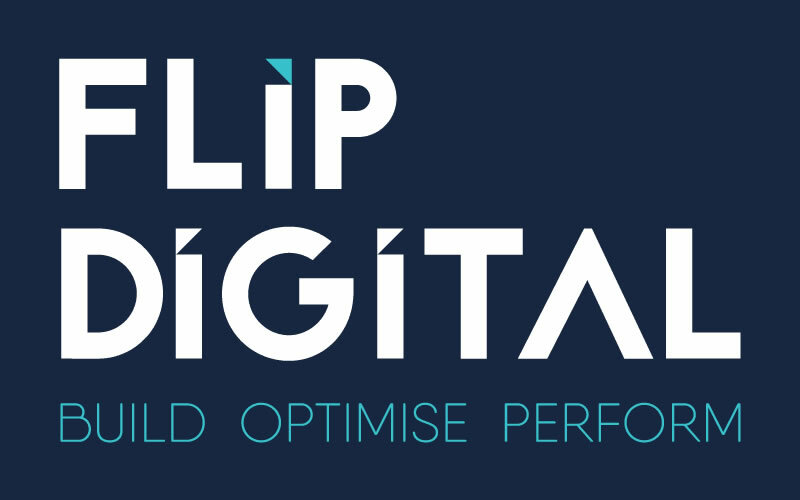 You can pre-register online up until midday on Thursday 28th March 2019. You can still pre-register with the registration team at the Wanaka Primary School office, 7 Ironside Drive, Wanaka – between 4-7pm on Friday 29th March. If you pre-register you have the option to collect your rider pack at the Wanaka Primary School office between 4-7pm on Friday 29th March, and if you can’t make it then your pack will be available at the registration tent on event morning. PLEASE NOTE: Registrations will be limited to 1000. If adverse weather causes track closures limiting the number of riders we can have out on the hill, then pre-registered riders will be given priority to ride the tracks that remain open. Rider registration on the day will commence from 7:30am onwards. There is no cut off time for rider registration – you can register at any time during the day. For more information check out our registration page. What time are the safety briefings? On the day of the event, there will be a rolling audio safety briefing. All riders are required to attend an audio briefing at registration. This safety briefing will continue to be available to all riders throughout the day. Yes, ATV’s will be permitted on the Family / Intermediate tracks. How long is each trail? If you are riding the Advanced and Expert trails we recommend you have a full tank of fuel before leaving the base paddock. Where is the entrance to the base paddock? The base paddock is located on Long Gully Station, off Jolly Road. 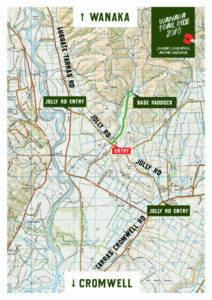 Jolly Road is a loop road and the entrance points will be clearly sign-posted from the Red Bridge, and the SH8 and SH8a turn-offs. Will there be food and drink available to purchase on the day? Coffee Van onsite from very early. Spark Arrestors are compulsory and we will have materials available for purchase on the day if you arrive without a spark arrestor. What is the scrutineering process on the day? We will have a rolling audio safety briefing that all riders are required to listen to. 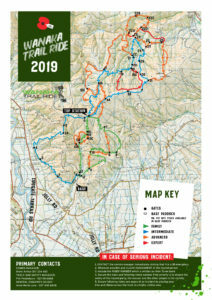 All riders will be provided with a briefing sheet which will also have our safety briefing and a copy of the Trail ride map when they sign in. Safety information will be clearly signposted at the entrance to each track. It is the rider’s responsibility to adhere to Wanaka Trailride’s safety and riding rules and ensure that equipment is in good working order. What if I break my bike or run out of fuel on the track? If there is a problem with your bike and you have to leave it on the course we will use our best efforts to help you retrieve your bike. However, some areas will only be accessible by helicopter. The cost of helicopter retrieval is $250 and must be paid before your bike is recovered from the course. See the registration tent for payment. Base paddock contact details will be available on your rider booklet. Is there a pee wee track? A pee wee track will be set up for all junior riders who are not riding the main tracks. The track will be open from 10am to 3:30pm and every child on it needs to be supervised by a parent. Access to the track is free although you are welcome to make a $5 donation at the registration tent on the day. Given the variety of factors involved, refunds will be considered on a case by case basis by the organising committee. Please contact info@wanakatrailride.org if you’d like to request a refund. How secure is my registration/payment information? Check out our Security Information page for details. What is the age of a junior rider and what is the policy around junior riders? All children under the age of 16 years old as at 30th March 2019 is classed as a junior. All junior riders are required to be supervised by an adult rider at all times. Can I camp at the Trail Ride the night before? Sadly, no camping is permitted on site, however there are loads of camping (paid and unpaid) options in the Cromwell & Wanaka region – Dr Google can help you out.